The Viéville tarot is outstanding for many reasons. First of all, it is one of the rare tarots of the XVII century which is complete. It has been preserved in the French National Library for many centuries. But above all, it is very unusual. This originality has two distinct advantages. First of all, the arcana are not restricted by a name. When an object or person is named, apart from the practical aspect, they are in some way limited. The name ‘condemns’ them to a category. The definitive attached label precludes any further speculation or questioning. For this reason, a certain ambiguity will always remain for some cards. We can speculate on whether the arcane XXI is LE MONDE (the world) or LE MONDE DEPAR (the world departure) or even SAINCT, (saint) as it contains the only character to have a halo! We can try to discover who the CESTE DAME (chaste lady) is, and also the AMOREVX . (the lover). In other cases, we will be able to read the name on many lines, for instance for the arcane VIII which is surely the PRINS QVYSOIT TRANNAY (prince who is being pulled) because the chariot is being pulled by two strange centaurs, and even perhaps being pulled AV DYABLE, (towards the devil). Who knows? The result is the names are not fixed, they are not “engraved in marble” and are open to many combinations . Secondly, this aspect of the Viéville opens up new possibilities because the names form a strange text. The Ace of denier contains a sort of invocation which starts by PERE SAINCT FAIT …. (holy father do) as if it were a question of a creative divinity. The Two of cup gives us a glimpse of a cosmic dimension with LA LVNE LES ETOILLES (the moon the stars) and the power of fire from the sky with La FOVDRE (lightning). 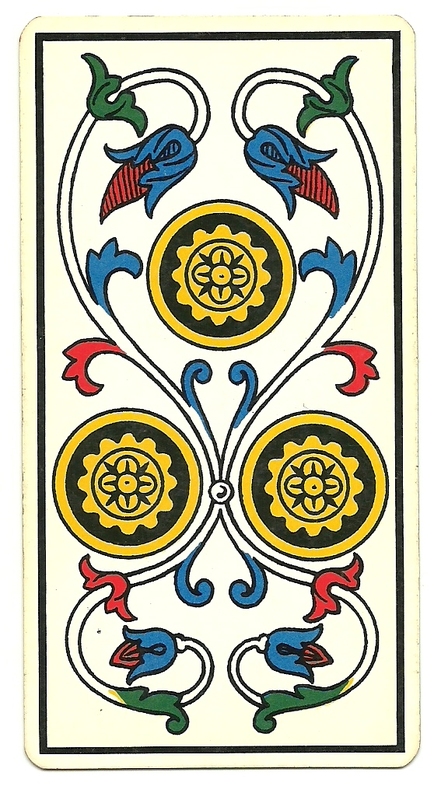 In the case of the XII arcane, the absence of the name on the card gives increased freedom, as is seen in the succession of the XII arcane , taken respectively from the Viéville tarot (circa 1650), the Dodal tarot ( circa 1700) , the Madenié tarot (1709) and the Conver tarot (1761). We can see that the absence of the name in the Viéville gives us the number XII as if indicating the top and the bottom. In the Dodal and the Madenié, the presence of the name introduces an ambiguity and the double possibility of levitation or of hanging. However, irredeemably in the levitation position in the Viéville, the Dodal and the Madenié, the character of the XII arcane is thereafter found in the position of the hung man, from Conver on. 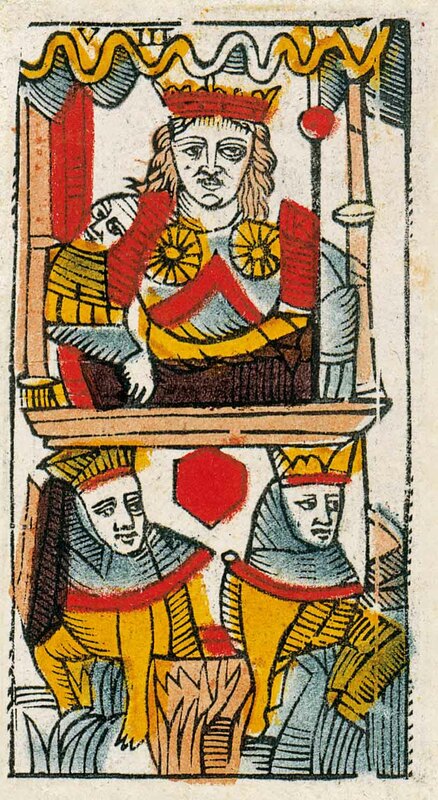 In the 20th century edition of the Marseille tarot by the editor Grimaud, the character of the XII arcane is definitively being hung. It was the end of the levitation and of this subtle sensation where the character of the XII arcane seems propelled – by the hands which push him in his back – into a gyration. 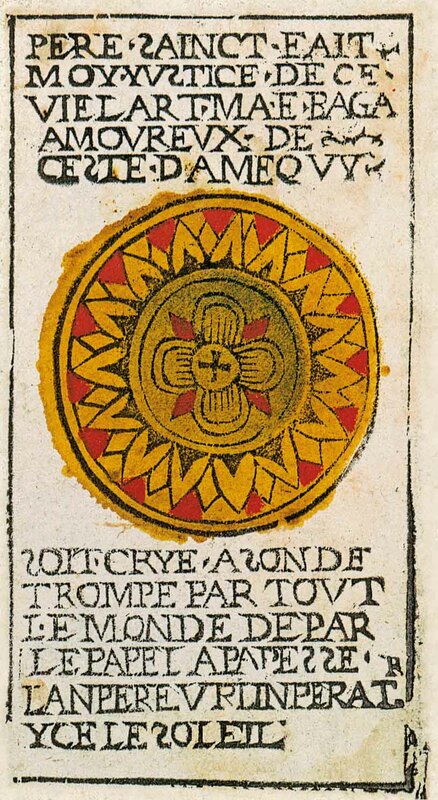 Another essential characteristic of the Jacques Viéville tarot is the richness of its representation. We will cite only one example which speaks for itself. Let us compare the extreme destitution of the Three of denier of the Grimaud edition of the Marseille tarot with the exuberance of the Viéville Three of dernier. We are justified in asking where the information has gone, why has this profusion of detail been erased in this modern reinterpretation of the tarot? For the Viéville tarot, it is first and foremost an extremely precise representation. At first sight, the reader might think it is exaggerated to such an extent that the lines of the drawing in the Viéville appear on the contrary imprecise and unrefined. Appearances can be deceptive. In the next card, the VIII arcane, the drawing of the prince seems anarchic : no left arm, a rough right hand, shoulders askew. However, the precision of the representation is in inverse proportion to the first impression that we receive. See how the prince’s right hand is sectioned by the grey steel triangle, and how the two jewels of the crown capture the wave! Readers familiar with the Marseille tarot will surely be surprised to find that the VIII arcane is here the Chariot and not the Justice. “It is necessary to open a parenthesis here. 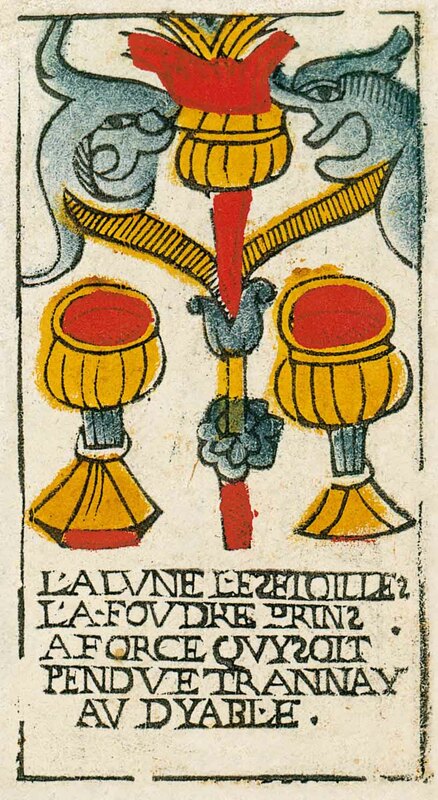 Many scholars of the tarot are surprised that, contrary to the Viéville tarot, the Marseille tarot traditionally represents the VII arcane as the Chariot and the VIII arcane as the Justice. Many people find the association of the number 8 and the notion of justice disturbing. The number four represents the earth and number three the sky. The form for the number four is the square, and for the three, the triangle. Seven is the expression of the sky on the earth and the notion of divine justice, certainly the highest philosophical notion, along with divine love, is expressed well by the number 7. Number eight, consisting of a double square, reflects an eminently terrestrial nature, and so expresses clearly the inherent difficulty of the progression of the action to the earth. The chariot, heavy and slow finds its place in this logical succession. At the other extreme, only the justice of men, slow and hesitant, or on the contrary fast and inequitable, a pale imperfect reflection of divine justice, will eventually find its justification as the eight arcane. But we do not consider, as we have shown, the justice of men an expression of the arcane YVSTICE. The above is a small introduction to this extraordinary 17th century esoteric tarot. It is worth while spending more time dwelling on it, because the more we get to know it, the greater its enchantment !